911uk.com - Porsche Forum : View topic - 40k on a GT3, which one would you choose? 911uk.com Forum Index > 911 GT, R & RS Models (1973 - current) > 40k on a GT3, which one would you choose? 2004 GT3 CS in Atlas Grey with too many mods to list! I don't know why I hang around with you wusses - a bit of inclement weather & you tuck them away unused for weeks and then moan about withdrawal symptoms. FFS, man up! Location: Not where I want to be! Sorry to dive right in without a proper introduction, but this thread caught my attention have been lurking around the forum for a while and thought it was time for a first post. Any others worth considering around my budget? You're right, Spennyb's car is a peach. I've seen it at Chris Franklin's and I would say it's as described. He's spent money on making it look good & go well and it shows. Don't know about the first one, but with Alcon's and 888's it's likely to have been tracked. That's not necessarily a bad thing, but it puts some people off for some reason. It's also extremely cheap for age & miles, so you need to ask why. Generally GT3's wear their age & miles well, but there are some dogs out there with hidden damage. Don't just rely on a clear HPI check, get any car you are looking at buying properly inspected by someone who knows what to look for on GT3's. I present to you the one and only Andrew Hall - legend in his own right and Scout leader. Those pics don't look like a bad shunt imho? You sure that bent the chassis? CatDs are down at the 30 mark, this wouldnt be much more with that mileage and use. 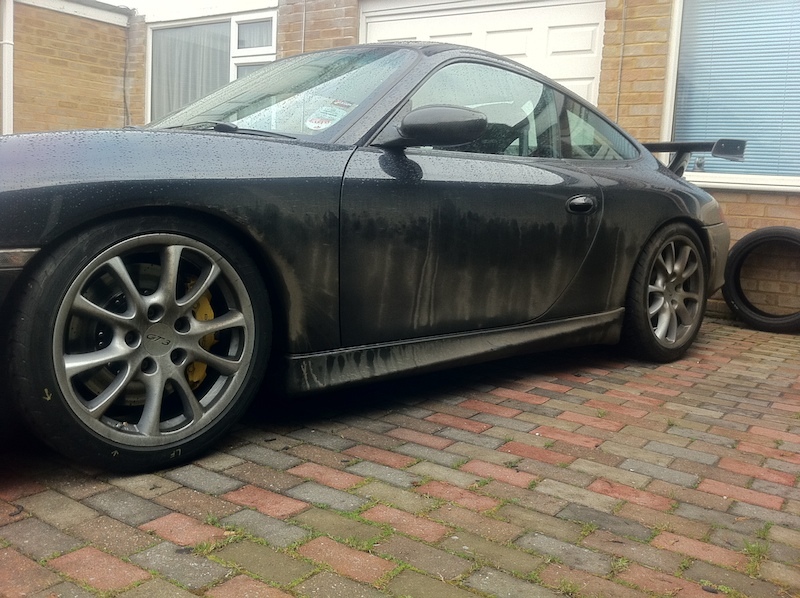 GT3's are bullet proof but they need looking after, this car has all the signs of heavy track use, any sensible buyer should budget for gearbox/diff rebuilds which arent cheap, also the age/condition of the wrap, doesnt last forever. Trade bid on such crash track cars (CatD or not) with high miles are down in the 20's but 35 is what we could 'hope' to sell it for and we certainly couldnt warranty any of it. Posted: Sat Nov 10, 2018 8:31 am Post subject: Re: 40k on a GT3, which one would you choose? Hypothetically ofcourse. I'm just speculating and saw these advertised. Which 1 would you go for? The MKI is slightly over priced and the MKII looks a good buy, money wise that is. History: Full Porcshe Main Dealer and GT3 specialist JZ Machtech Service History with comprehensive documented history file. Pristine Low Mileage Example of a future classic. Only 14,000 miles - road use only. No track use. Owned by Meticulous Porsche Enthusiast. LEFT HAND DRIVE. Immaculate Black bodywork; Full Black Leather Sport Seats; Comfort Pack; Ceramic Brakes; RS Suspension; RS Rear Wing; Carbon Pack; Colour Coded Centre console and seat backs; Air conditioning; Cd Player; White Dials; Litronic Xenon Headlights. It’s amazing what one could find on the internet, the first car in the above post is my car! I’m the fifth owner; the second, third and fourth owner are all 911uk member. The first remains elusive. Ah the good ole days eh YK. At least you're in one now eh. I'll climb the ranks again one day. Posted: Sat Nov 10, 2018 12:47 pm Post subject: Re: 40k on a GT3, which one would you choose? 2005/55 PORSCHE 996 GT3 THIS ONE OWNER EXAMPLE HAS TO BE ONE OF THE VERY BEST SET UP EXAMPLES.FITTED WITH MOTON 3 WAY ADJUSTABLE SUSPENTION FITTED BY TECH 9,6 POT PORSCHE FRONT BRAKE CA;IPERS WITH UP RATED FRONT DISC AND PADS,SPORTS EXHAUST,PORSCHE REAR BOLT IN ROLL CAGE,NOMEX PORSCHE CRESTED BUCKET SEATS WITH 6 POINT HARNESSES,RED BELTS,FULL SERVICE HISTORY,PAINT PROTECTION,AN EXHILIRATING AND VERY REWARDING . It’s fun researching my car’s history....... just don’t look at cars’ prices then.